As parents, we only ever want what is best for our little ones. However, in our busy and time-consuming lives, it’s not always possible to have freshly prepared food on hand for dinner time every night. Also, not all of the fruit and vegetables you find in stores is top of the range. So, what’s the next best thing for busy parents who want to give their babies the best? It’s got to be organic baby food. No preservatives, artificial additives or other chemicals that you would find in regular food. Just plain and simple recipes that give your baby everything they need for the healthiest upbringing. To give you a helping hand, here is a collection of some of my favorite organic baby foods that your little-loved ones are simply going to love. Say goodbye to days of not wanting to eat and say hello to delicious meals. 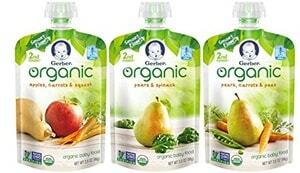 Do I Really Need Organic Baby Food? How Do I Know I’m Buying Organic? To start my list, I’ve chosen one of the leading organic baby food producers that will give your baby everything they need. Inside each pouch, you’ll find a delicious collection of fruit and vegetables, and that’s all. There are no artificial flavorings, no potentially harmful chemicals, just 100% fruit and veg, ensuring that your baby gets the best. To further this level of healthiness, each one of their eleven amazing flavors is USDA approved and organic certified, so you can be safe in the knowledge that you’re buying a product that’s been tried and tested by the professionals. The contents of each pouch aren’t diluted with water, and it’s simply the best fruit and veg in a convent squeeze pouch. What's Great About It: To make things even better, the Peter Rabbit company has designed these squeeze pouches to be 100% free from potentially harmful BPA and PVC chemicals, guaranteeing the well-being and good health of your baby. As parents, you’ll want to be completely in the know about everything that goes into your baby’s mouth. However, you don’t want their meal times to get boring, usually resulting in kicking and screaming that you don't want to deal with after an already long day. With this in mind, Gerber gives you the chance to try this unique and enticing variety pack, each containing six pouches with three different flavors. What’s more, the contents of these pouches are pure and organic. Each recipe has been approved by the USDA, resulting in it holding an organic certification, meaning there are no harmful chemicals, starches, flavorings, extra coloring, or GMO ingredients. Each squeeze-pouch is made from BPA-free materials, enabling you to give your baby the best quality food that is delicious and nutritious. What's Great About It: Perfect for babies in the second stage of eating, these convenient pouches are ideal for at home or on the go. Simply pop one in your bag, and you’ll have one handy whenever your baby gets hungry. Get ready for easy and stress-free feedings ahead. 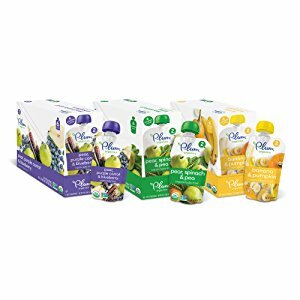 If you’re looking for the ideal food for your baby while successfully introducing the first stages of solid food, Plum Organics has got a product that you’re sure to love. These Stage 2 pouches are ideal for babies aged six months and up, and come in a different pack sizes to match your budget and flavors. There are also variety packs available, enabling you to discover your child’s favorite flavor, guaranteeing happy, stress-free meal times. Each recipe has been meticulously tested and approved by the USDA, certifying it as completely organic. This means there are no GMO ingredients, artificial preservatives, flavorings or artificial sweeteners, ensuring your child has the best and healthiest upbringing possible. What's Great About It: As Plum is renowned for being one of the leading child food brands, you expect big things. These pouches don’t fail to deliver. In addition to their BPA and PVC-free packaging, you’ll also enjoy the added benefits of a resealable pouch, ensuring your baby only has what they need while maximizing your budget as you can save the rest for later. 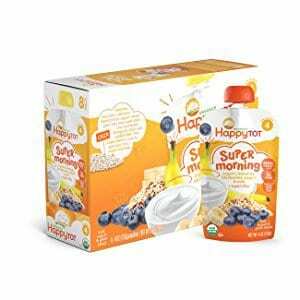 Suitable for babies and children aged six months and above, I found that Happy Baby was everything I could need in a baby food. These large and affordable multi-packs provide you and your baby with the opportunity to explore and discover a range of different flavors. There are four flavors in total, each with four packs, including the freshest ingredients including bananas, mango, spinach, and apricots. There’s so much goodness in each pouch. As you would expect, each recipe has been certified organic, allowing you to feed your baby food that’s completely free of any kind of artificial chemicals, additives, flavorings or preservatives. The packaging is completely free of BPA chemicals, ensuring your baby really does have the healthiest upbringing and the most productive development possible, both physically and mentally. What's Great About It: With the outstanding amount of choice that Happy Baby grants you, you really do get a chance to explore your baby’s favorite flavors. In total, there are 13 unique flavors to explore, meaning you can pinpoint exactly which ones your child likes, guaranteeing stress-free dinner times. Throughout the stages of growth you won’t want to stop feeding your baby the best possible food, even when they reach Stage 4 and above. With this in mind, Happy Tot has developed this completely organic baby food, keeping you safe in the knowledge that your growing bundle of joy is receiving all the vitamins and nutrients they need. As your child grows, they’ll be able, and more willing, to experiment with different foods that still give the same level of health. With the Happy Tot pouches, you’ll be able to explore new ingredients such as yogurt, whole grain oats, chia seeds and organic fruits, all blended up into one affordable, easy to use pouch. That makes these pouches perfect for breakfast or lunch. As your child grows, they’re even suitable as a midday snack. What's Great About It: In addition to the BPA- and PVC-free packaging, you’ll also be able to enjoy the added benefits of these wholesome organic recipes that are both gluten-free and Kosher approved, making them suitable for all children. 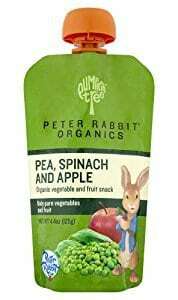 To conclude my list of some of the best organic baby foods on the market, we’ve come to one of my favorites. If you’re looking for a fully nutritious baby food that your little one is going to love, you’ve come to the right place. The Earth’s Best Baby Food unique comes in jars, meaning there’s absolutely no risk of any potentially harmful PVC or BPA chemicals, while also prolonging the life of your baby’s food. Furthermore, these wholesome and fresh meals are designed to be suitable for babies from six months and up, so basically when they can start eating solid food. 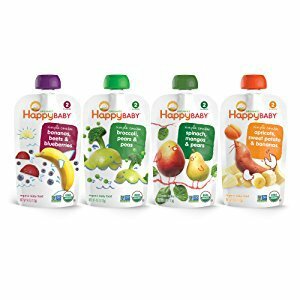 There are four unique flavors to choose from, including apple, butternut squash, mango, and banana, all combined to give your baby everything they need in one convenient, easy-to-use container. What's Great About It: Earth’s Best markets itself as being one of the best. Their recipes are completely free of hormones, pesticides, herbicides, steroids, GMO-ingredients and other substances. It only contains pure, organic, Kosher-approved, USDA organic certified goodness. Choosing the food that your baby eats is possibly one of the biggest decision you’ll make at this stage. It will affect their growth, development, physical and mental well-being, so it’s imperative that you get it right. However, this doesn’t have to be a daunting task. Scroll down, and you’ll discover everything you need to know, ensuring you make the best decision. This is easily one of the most common questions asked by parents. Granted, traditional baby food is definitely more affordable and will help you to stretch your budget. However, there’s no guarantee as to what chemicals are included in these foods. For example, if you purchase a traditional fruit and vegetable baby food that isn’t organic, your baby could be consuming a whole range of harmful substances that will affect their health in both the long and short term. These substances include, but are not limited to pesticides, genetically modified ingredients, growth hormones, herbicides, artificial flavorings, artificial preservatives and arsenic. By investing in organic baby food, you are minimizing, if not, eliminating the risk of these chemicals entering your child’s body. When choosing the right baby food for your child, it’s important to choose the right stage. Each stage has different requirements, and the recipes will have been produced according to these stages. When it comes to baby food, there are four stages to choose from. 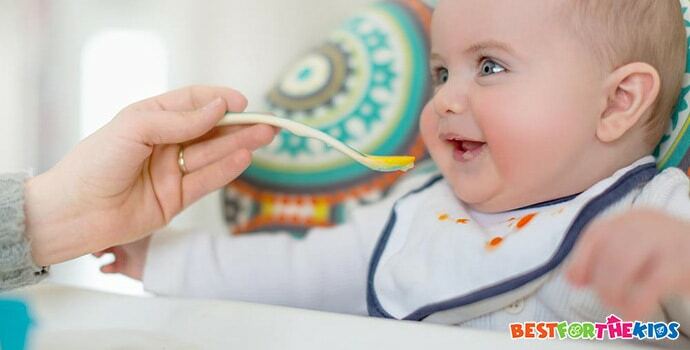 This is the starting stage that refers to when you start to introduce solid foods to your child. This is typically when your baby is around 4 to 6 months old. Recipes categorized under this stage are usually relatively plain and can include ingredients such as carrots, peas, potatoes, and bananas. Recipes found in stage two are usually very similar to the recipes found in stage one. However, the texture of these foods will still be smooth, but not as smooth as stage one recipes. It’s at this stage that the recipes tend to get a bit more interesting and you’ll really have the chance to start experimenting with flavors. You may start to introduce this stage around the 6 month mark. Suitable for children aged around 7 to 9 months old, these recipes tend to add chunks to their meals, giving children the ability to learn the chewing technique with their gums or as their teeth begin to develop. They’ll also come in larger portion sizes as to accommodate your child’s growing appetite. You may use the baby food for breakfast and lunch, and at this stage, you can start mashing up some of your own dinner for your child. The final stage is aimed towards babies who are 12 months and older. Although these meals are designed to be easy to chew, they’ll have a lot more chunks and texture compared to the rest of the stages. These are suitable for all kinds of meals and can be used when a child is learning to use a fork or a spoon on their own. These meals also tend to be highly convenient, meaning you can feed your baby on the go. More in Baby Food: What are the Best Baby Food Makers? The USDA has very strict regulations when it comes to organic food. If a product, such as baby food, is labeled as organic, it means that 95% of the meal in front of you is organic. Be aware that there is a 5% discrepancy. This means there are no chemicals in the food and that the ingredients have not been radiated to eliminate diseases such as E-Coli or Salmonella. If you’re buying meat products, organic means that the animals have not been fed modified chemicals or growth enhancements. Also, be aware that food that is marketed with terms such as ‘free-range,’ ‘natural’ or ‘pure’ does NOT mean that the product is organic. Only food that has passed the USDA’s testing measures can be labeled as organic. Choosing the right food for your baby at such a young age is crucial. With child obesity levels higher than they have ever been in history, feeding your child wholesome and nutritious food throughout their life has never been more important. Using my list above, it’s easy to make the right choices, benefiting both you and your bundle of joy.